Getting the best PS4 headset can make a huge difference to your gaming life. While the speakers on your gaming TV are likely just fine for whatever you need, a great headset can bring you sounds you never even knew were in your game, and enhance the audio you already hear dramatically. The very best PS4 headsets will even give you an edge in competitive online games, letting you hear opponents approaching you, allowing you to work out where gunfire is coming from, and even hearing enemies talking to each other if they're close by. If you're looking for an advantage in Fortnite or Apex Legends, a great headset is a good start. 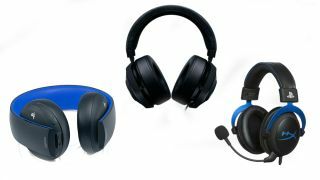 So, what makes for the best PS4 headsets? We test all our headsets thoroughly, and look at a number of things. Firstly, sound quality is important. Cheaper headsets usually handle bass well, and can go very loud, but their overall sound quality is usually sub-standard. We test the frequency response range of each headset, which is essentially the 'range of sound' it offers. If a headset has a higher frequency response, the audio is richer and more versatile. We also look for comfort. No point settling down to one of the best PS4 games only to have a headache after 30 minutes. And there are a few other things to consider: how good is the mic? How well designed is the headset? Does it play well with movies, TV and music? Are there extra features? Finally - how much does it cost, and is it worth the money? The list below represents the best PS4 headsets we've ever tested, and we constantly check the prices to make sure you're getting the cheapest deal possible. Razer recently redesigned the Kraken Pro V2, and is now simply calling it the Razer Kraken. That's the model that sits at the top of our guide as the best PS4 headset. Not because it has the best sound, although it does deliver excellent audio through the 50mm drivers inside its comfy earcups, but because it represents the best value of all PS4 headset options. It retails for around $80 / £70, but performs on the same level as headsets that cost twice that much. It's well designed, simple to use, and it's well tuned to gaming audio, offering excellent audio imaging that really helps you place yourself in a gaming world. The Kraken is available in four colors, with a black and blue variant designed to be in keeping with the PS4 and PS4 Pro's aesthetic. Because of that you may not fancy the green version unless you plan to use it with a particular rival console; the pink and solid black versions are also available. It has an audio control slider half way down the cable, which makes it easy to use, and there are no actual controls on the headset itself. It's well padded and comfortable, and the minimal design means you'll look fine while wearing it. It performs admirably outside of gaming, but its true audio quality is definitely reserved for PS4 play. The retractable mic brings clear voice chat, and it picks up pretty much everything you say into it, transmitting a nice, clear voice across shooters like Apex Legends. What you're getting here is an excellent PS4 headset for your money, and with the recent tweaks Razer has only improved the formula. You would be hard pushed to find another wireless headset with the sound quality and feature set of Sony’s dedicated PlayStation Platinum cans. In fact we’d argue that it’s pretty much an impossible task - the Sony headset has a fantastic mix of price and performance. If the Platinum is too expensive, we'd actually really recommend the Gold version too, which is about $40/£30 less, but doesn't quite offer the same quality of sound or the extra metallic trim. The 50mm drivers maybe lack a little power at the low-end but they have an impressive level of clarity to their overall audio. They also neatly hook up to your PS4 offering game-specific audio profiles. But the big tick for them is the 7.1 virtual surround that links into those profiles. Well, that and the fact your headset battery will likely outlast your controller’s too. It's worth noting that as both the Platinum and Gold headsets are Sony PlayStation official, they have been designed with the PlayStation VR headset in mind too. This means they will fit neatly and comfortably on your head when wearing the headsets in conjunction with the PSVR gear. Check out the best PlayStation VR bundles here to complete such a package. The Razer Nari Ultimate is the only gaming headset with rumble functionality. Yes, this PS4 headset will actually vibrate when you hear bigger sounds (although, you can disable this function), and it does actually make a difference to how immersed you feel in the game. It's what Razer called Hypersense technology, and while it won't necessarily revolutionize all gaming headsets, it's one of the few gimmicks we'd actually recommend you try. As for the rest of the headset, well, you're getting a really great wireless model here. The battery life is excellent, clocking in around 8 hours with haptic feedback enabled, and 20 hours without it, so you're not constantly recharging during long sessions. The connection is incredibly solid too, with almost zero artefacting or loss of sound, and the headset is surprisingly light and comfortable, meaning you won't really feel it on your head unless you're playing for extended sessions. The frequency response range doesn't quite match the SteelSeries Arctis Pro, so the sound isn't quite as crisp for non-gaming applications, but this is a thunderously good PS4 headset with a key feature that you won't find in any other model. If you're looking for a PS4 headset that does it all, the Creative SXFI Air is the best choice. While it's not a pure-bred gaming headset, it handles all game audio perfectly, and retains most of its control features while connected to PS4. It adapts superbly in games like Assassin's Creed Odyssey, hitting those loud combat noises before delivering rich in-game dialogue, a feat few headphones manage. However, where the SFXI Air excels is in its comfort and versatility. Outside of gaming it's a brilliant wireless headset, and works superbly with all media - every type of music, movies, TV shows... this delivers superb sound no matter what it's connected to. Which makes up for some shortcomings, like the fact you need to buy a separate mic, or the fact it's kinda big, so you look like you're definitely wearing a bulky piece of tech when you're using it. Creative has a long heritage in audio, so it's no surprise this performs so well. If you're looking to get a more specialised gaming headset with similar sound stats, we'd recommend the SFXI Air C, although it isn't as versatile. Turtle beach's latest range of wireless cans are a brilliant balance of sound quality and comfort. The lack of any cable is an immediate plus, but that practical feature doesn't result in any compromises to the sharp sounds emanating from the in-built speakers. Crafted with noise cancelling capabilities, it's in the long hours in game that you'll notice just how ridiculously comfortable the headset is. Turtle Beach is known for comfort, because it makes headsets exclusively for gaming, so all its cans are designed with long sessions in mind. The Stealth 700 also has a lot of flexible tweaking options, including the ability to amplify sounds like footsteps and gunshots, in addition to Bluetooth connectivity and an official mobile app which lets you take calls and steam music from your phone. Add in an ultra clear mic and this makes for a perfect headset with great sound and real comfort factor. Plus, at just over $100/£100 - that's a fantastic price for a quality, wireless headset. It's comparatively higher price tag might be daunting for a headset at first, but you'll absolutely be getting your money's worth with the Steelseries Arctis Pro. Its high-res audio system is industry leading in its clarity and range, while the option to go wireless and bypass the PS4's DAC with SteelSeries' own GameDAC peripheral accentuates the quality of this sound. But you do really need to know what DAC is to get the most out of the Arctis Pro. All of its features are fully customizable via the peripheral's OLED menu, too, while the headset's alloy build also looks and feels high-end. This is a headset you can quite easily take out of the home and show off in public, although its core strengths are tied to the PS4. If you're looking to mess with your set-up to get a truly bespoke, high-quality sound (and you're technically savvy) then this is one of the best PS4 headsets you can buy. This headset is lazer-targeted at anyone who loves to win at shooters. It features a system called Superhuman Hearing, which ups the sound created by footsteps, nearby movement, gunfire, and all the telltale signs that someone is sneaking up behind you in Black Ops 4 or Fortnite. It gives you an incredible edge in competitive online games. The surround sound is also excellent, and it genuinely places you in the middle of any game you play. In addition to that, the Elite Pro 2 is a rather comfy piece of kit, and the plush ear cushions are perfect for long gaming sessions. It even caters for people who wear glasses, to mimimize the pressure on your ears. No, the Elite Pro 2 can't quite compete with the sound quality of the Sennheiser and SteelSeries entries on this list, and it's a little weaker when you're watching regular TV and movies, but as a PS4 headset, this is an accomplished and specialized choice for anyone interested in nabbing Victory Royale more often. If budget really is an issue, the Turtle Beach Recon 50P is your friend. What it does is deliver very reasonable sound for a sub $30/£25 price, punching well above its weight when compared to many mid-priced headsets. Sure, the 40mm drivers aren't going to deliver sound as loud as the more expensive models with 50mm components, but it's often just as clear AND the stereo audio here does a decent job at emulating full surround sound. What's more, the Recon 50P is relatively comfortable - the ear cushions are excellent, although we miss the padding on the headband - and the adjustable mic isn't intrusive. The overall design is good, and sturdy, so this isn't a headset that'll fall apart if you're overly rough with it. The blue and black/white models even fit in with your PS4's overall design aestheric. The wired connection plugs neatly into your PS4 controller's headphone socket, so it's simple to set-up too. Our only real concerns with this headset come with the mic, which isn't the best, and the fact that the headband lacks that layer of padding in the more expensive models. If you want to spend a little more (maybe $20/£15), you could go for the Turtle Beach Recon 150, which offers a better headband, but at $30 / £25 the Recon 50P is a real bargain.